They're small, round, and... not too bright! And they need your help to get home safely! Goobs are little fun loving creatures from the planet Stoompf. But these particular Goobs have got themselves stuck on a series of floating space platforms, and they need your help to get back home. 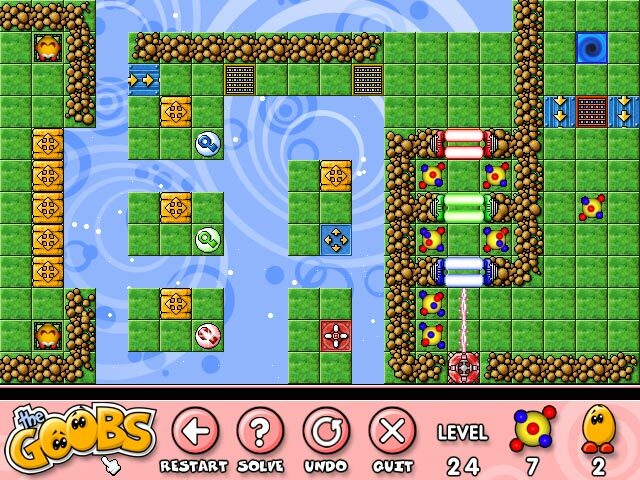 In this original fun puzzle game you must guide the Goobs through 55 exciting levels, solving puzzles and collecting energy balls. Includes FREE level editor! They're small, round, and... not too bright! Can you help them get home safely? ...... collecting energy balls, while finding (or making!) a path to the exit tunnel. Some of the things you might encounter include Lazer beams, Pusher blocks, Collapsing tiles, Pressure switches, and lots more! With multiple Goobs on each platform, you'll enjoy making them work together to find the solutions to each of the fun and challenging levels. Also the game not only has a built in help system, but also a built in, easy to use level creator! So not only do you have 55 original fun levels, but you can even have fun creating your own, sharing them with friends, and downloading new levels online. A fun, original, challenging, and rewarding game that is suitable for all ages! Is a great arcade puzzle game . The Journal makes it easy for you to keep a personal journal or diary! Take on the wrath of The Qube in this ADDICTIVE 3D Puzzle Game!!! Download SliceTheWeb to strictly organize and keep your information in order. The object of the game is to capture your opponent Flag before yours is captured. Is a fox and she wants to make a cake for her kids. Qweas is providing links to The Goobs 1.2 as a courtesy, and makes no representations regarding The Goobs or any other applications or any information related thereto. Any questions, complaints or claims regarding this application The Goobs 1.2 must be directed to the appropriate software vendor. You may click the publisher link of The Goobs on the top of this page to get more details about the vendor.